In 1977 Ethiopia and Somalia engaged in a brief territory conflict over the Ogaden region situated between and claimed by both nations. This conflict however held significance greater than most territorial disputes because Ethiopia was backed by the Soviet Union and Somalia was supported by the United States, thus bringing the Cold War to eastern Africa. Long before the 1977 conflict, the Ogaden had been subject to dispute. Following World War II, when Ethiopia had been aligned with the Allies against the Axis Powers, Great Britain relinquished its claim on the Haud and Ogaden regions as part of British-Somaliland. When British Somaliland became part of the newly independent nation of Somalia in 1960, that government took control over the region. They intensified their control when a military coup led to the assassination of Somali President Abdirashid Ali Shermarke, and the army’s seizure of control of the nation in 1969. Meanwhile in Ethiopia, long-time Emperor Haile Selassie was overthrown in September of 1974 by the military council known as the Derg. The nation was in disarray as a result, and numerous separatist movements opposed to the Derg emerged out of the political uncertainty. One of those groups, the Western Somali Liberation Front (WSLF), made up of Somalis living in the Ogaden region of Ethiopia, called for the annexation of the area they controlled to Somalia. By 1977 Mengistu Haile Mariam had become the leader of the Derg which now controlled all of Ethiopia. The Derg violently suppressed all Ethiopians and in particular the WSLF and its supporters. By this point, they had declared Ethiopia a Marxist state and allied it with the Soviet Union. The Somali government, which had previously received considerable amounts of Soviet Aid, now provided weapons and supplies to the WSLF. In July 1977, the Somali National Army of thirty-five thousand, led by Mohamed Siad Barre and aided by fifteen thousand WSLF militiamen, invaded Ethiopia’s Ogaden region. 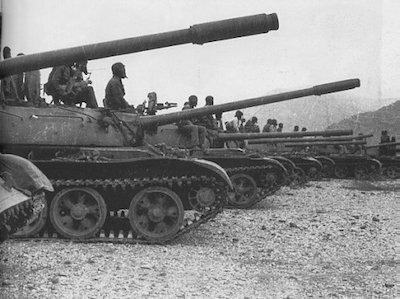 The Somalian Army was greatly outnumbered by the Ethiopian military, but they had superior artillery and air force because of earlier Soviet military aid. The Soviets were also supplying their new ally, Ethiopia. After unsuccessfully attempting to negotiate a ceasefire, they threw all of their support to Ethiopia, bringing in fifteen thousand Cuban troops as well as “volunteers” from other communist nations such as North Korea and Yemen. In response, the Somalis requested and received support from the United States. When the conflict began in July 1977, Ethiopia controlled approximately 10 percent of the Ogaden region. With greater and more consistent Soviet aid, however, they drove back the Somali Army and its WSLF allies. In October, the Somalis attempted their most significant offensive to capture the Ethiopian city of Harar. Here they faced forty thousand Ethiopian troops and eleven thousand Cuban troops, backed by Soviet artillery and air power. The Ethiopians prevailed at Harar and began to push the Somalis out of the Ogaden systematically. By March 1978, the Ethiopians had captured almost all of the Ogaden, prompting the defeated Somalis to give up their claim to the region. Martin Plaut, "Ethiopia–Somalia: A History of Conflict," Martinplaut, January 2013; Anthony Appiah and Henry Louis Gates, eds. Africana: The encyclopedia of the African and African American experience. Oxford University Press, 2005 https://scholar.google.com/scholar?q=Anthony+Appiah+and+Henry+Louis+Gates%2C+eds.+Africana%3A%20+The+encyclopedia+of+the+African+and+African+American+experience.+Oxford+University+Press%2C+2005&btnG=&hl=%20en&as_sdt=0%2C48; Kenneth G. Weiss, The Soviet Involvement in the Ogaden War. No. CNA-PP-269, Center for Naval Analyses, Institute of Naval Studies, Alexandria, Virginia, 1980 https://scholar.google.com/scholar?q=Kenneth+G.+Weiss%2C+The+%20Soviet+Involvement+in+the+Ogaden+War.+No.+CNAPP-269%2C+Center+for+Naval+Analyses%2C+Institute+of+Naval%20+Studies%2C+Alexandria%2C+Virginia%2C+1980.&btnG=&hl=en&as_sdt=0%2C48. Kenneth G. Weiss, The Soviet Involvement in the Ogaden War. No.